Automation Import Manager or AIM is an application to assist production, traffic and programming personnel in their everyday duties. It allows for the automatic placement of audio into a station’s automation system and posts the “as played” information back to the providing networks. Presently, there are many hours of labor involved between getting network barter content on the air and affidavits posted after they have played. Currently, traffic personnel must log in and check the network log for the upcoming week, schedule each piece of audio, assign specific cart numbers and then pass that information to production. Production takes that information and then needs to locate and download the audio, piggyback spots, adjust levels, add metadata and load this content into automation. Finally, after spots air, traffic (sometimes weeks later) obtain an air log from the automation system, search within the log for the time they played, log back into provider and then post back to the network the time it was aired. This is not to mention the extra time spent processing revisions correctly. Processing network ROS inventory, placing commercial audio in defined cart numbers within a station’s automation system complete with all metadata. Processing network ROS inventory that did not air on scheduled date. Processing long form shows downloaded by MediaShooter or FTP, placing them into a station's automation system complete with all metadata. Retrieving as played information from a station's automation system, and using that data to automatically post affidavits to content providers, including proper date and time of make goods. Processing vCreative local inventory, placing commercial audio within a station's automation system complete with all metadata. In the workflow for typical ROS inventory, the station’s traffic director schedules ‘placeholders’ under cart numbers of their choice for each :60 unit of network inventory. For example, if a network requires 2 minutes per day 6a-7p, the traffic director would schedule 2 unique cart numbers per day in which AIM will place the correct commercials based on the downloaded daily logs from the network. AIM will also make sure that each cart number is ‘filled’ with 60 seconds of inventory, and will piggyback shorter length spots as necessary to accomplish this. AIM formats all of the audio and delivers the finished files, complete with the appropriate metadata, to the station’s automation system using the specified cart numbers. The next day, when this daily process occurs, AIM retrieves the as-play information for the previous day from the station’s automation system, matches the data with the saved commercial schedule, and posts the completed affidavit to the network provider. 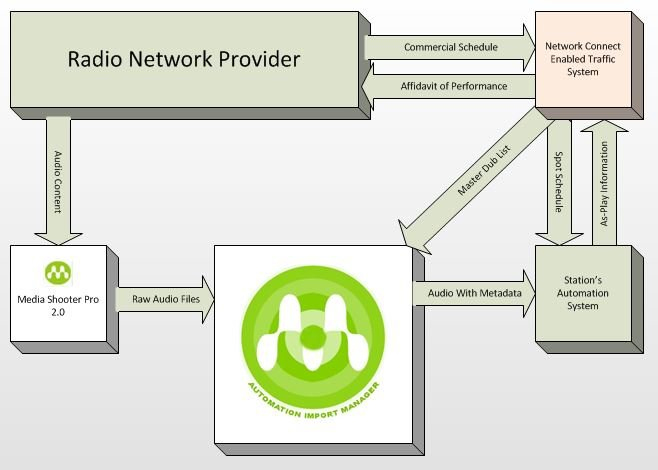 If a station is carrying a long form show (this could be a weekly or daily show with commercial inventory within it), AIM processes the audio and delivers the finished files, complete with the appropriate metadata, to the station’s automation system. The station’s music or traffic director schedules a series of cart numbers for the various segments of the show to play in the station’s automation system at the desired time. Once AIM knows what those cart numbers are supposed to be, it will retrieve the raw audio through Media Shooter Pro 2.0 (or FTP) and the commercial schedule for the program directly from the network provider for later reference. AIM formats all of the audio and delivers the finished files, complete with the appropriate metadata, to the station’s automation system using the specified cart numbers. The next time this process occurs, AIM retrieves the as-play information from the station’s automation system, matches the data with the saved commercial schedule, and posts the completed affidavit to the network provider. When used with Network Connect, A.I.M. takes on a slightly different role. In this scenario, the station is carrying ROS inventory from one or more networks. The schedules for the network spots are directly imported into the station’s traffic system through Network Connect and a master dub list is generated and sent to AIM. 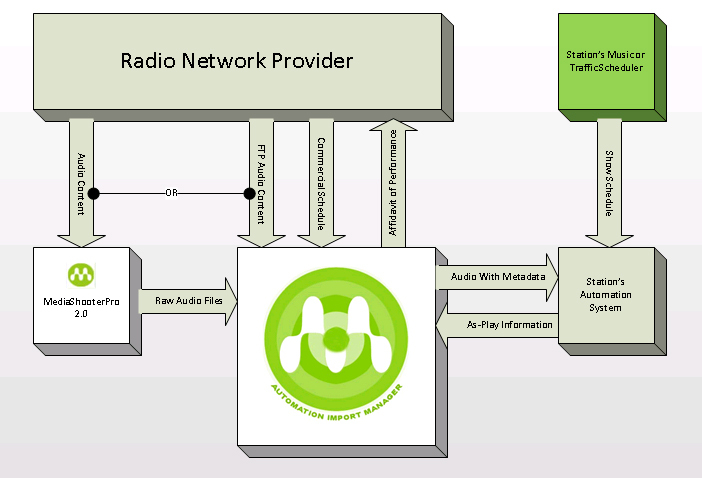 AIM will retrieve the raw audio through Media Shooter Pro 2.0, format all of the audio and deliver the finished files, complete with the appropriate metadata, to the station’s automation system using the cart numbers specified by the station’s traffic system. When used with Software, A.I.M. processes local inventory with the appropriate metadata. 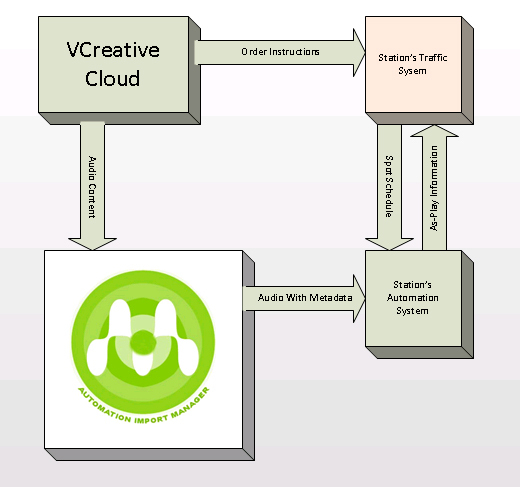 In this scenario, the station is using vCreative’s PPO system for processing local inventory. Once a minute, AIM will poll vCreative’s Servers and retrieve any audio matching vCreative’s and station’s criteria. AIM will format all of the audio and deliver the finished files, complete with the appropriate metadata, to the station’s automation system using the cart numbers specified by the station’s traffic system.